The Nortel IP Phone i2001 (Phase 2) is an entry level, single-line desktop IP telephone designed specifically for public areas such as lobbies, cafeterias, hallways, and break rooms. It is also ideal for low call traffic locations such as school classrooms and hotel rooms. 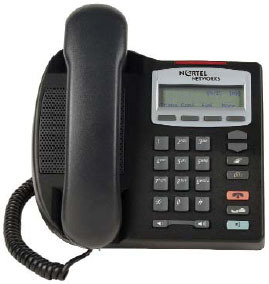 Standard features of the Nortel 2001 IP Phone include: 802.3af Power over Ethernet, a fully bit-mapped 2x24 character display, on-hook dialing, listen mode speakerphone, Message Waiting Indication, fixed keys, navigation and soft keys.